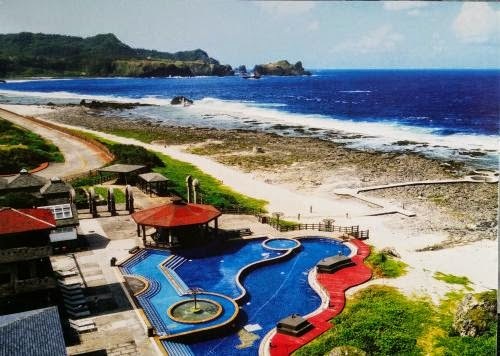 Postcard TW-1496923 from Taiwan shows Jhaorih Hot Spring (朝日溫泉), located on the south-east part of Green Island (綠島), in Taitung County, Taiwan. Green Island, a small volcanic island in the Pacific Ocean 33 kilometers or 21 miles off the eastern coast in Pacific Ocean, is the 4th largest island in Taiwan. It was known for its prisons and penal colonies for political prisoners during the martial law period between the late 1940s and the late 1980s. The prison was later closed, and the island is now open to the public. Jhaorih Hot Spring gets its name because it faces the Pacific Ocean to the east. Bathing in the morning in one of the three ocean-side spas, or one of the five terrace-like hot-water and lukewarm-water pools will guarantee a magnificent sunrise view in a sunny day. All pools and spas are fed by spring water from under the ocean floor with a temperature of 53°C or 127°F and a pH value of 7.5.